Publication day for the book that brings together much of what Gerry Gaffney and I have learned about creating better forms over more than a decade of practice, consultancy, teaching and research. “Forms are everywhere on the web – for registration and communicating, for commerce and government. Good forms make for happier customers, better data, and reduced support costs. Bad forms fill your organization’s databases with inaccuracies and duplicates and can cause loss of potential consumers. “Designing good forms is trickier than people think. Jarrett and Gaffney come to the rescue with Designing Forms that Work, clearly explaining exactly how to design great forms for the web. Liberally illustrated with full-color examples, it guides readers on how to define requirements, how to write questions that users will understand and want to answer, and how to deal with instructions, progress indicators and errors. “a straightforward, practical volume which outlines best practices for creating usable web-based forms”. Assure Dynamics, developers of dynamic forms and online systems, recommended our book in their blog post Laying out a form. November 2010. Arshi posted a long set of notes about the book on her blog R-She-Yeah: Thinking about forms and usability. May 2010. Aartjan van Erkel wrote a review in Dutch on his blog Schrijvenvoorinternet: Het op één na beste boek over webformulieren. April 2010. Foraker reviewed our book on their website Usability First, March 2010. “This book brings to light the idea that good form design isn’t just about looks—it’s about making sure you’re asking the right questions so your users understand how to answer”. Jim Lesko of Supply Chain Technology – The Portal: a look under the hood mentioned our book as a resource in his post Finding good UK design tips for business applications, February 2010. “an easy-to-follow, common sense approach that anyone having an interest in web design can pick up and process to make their user interfaces better”. “Let me start with my conclusion first – if you like waiting to the end of anything to know what someone thinks, I’m sorry I am not that kind of book reviewer – this book is better than you think it is”. “This was a quick read; short but solid. Most everything was review for me, but for those just starting with web forms, this would be great”. Jordi Rosell included our book on his 5 llibres #mustread sobre usabilitat (5 must-read books on usability). December 2009. Ayesha Habeeb Omer included “Forms that work” on the List of books you would want to read in the year 2010, December 2009. 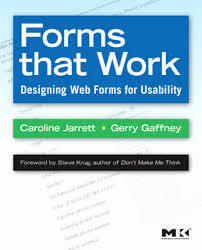 Gary J Anderson tweeted about our book: “Good refresh on effective and usable form design”, December 2009. Matteo Caprari reviewed our book on his blog, October 2009. Bennett McElwee reviewed our book and created a summary of key points from it on his blog, Semicolon, September 2009. “a practical book dedicated to making web forms usable and useful”. Neil Allison mentioned our book on his blog, Usability Ed. August 2009. “Forms that Work is a book that nicely compliments Ginny Redish’s Letting Go of the Words. Both sit on my bookshelf”. “But one of the best tips in the book focuses not on the form itself, but on working with the person requesting the form: always use a “form protocol” on which the requester must specify, for each and every field, who needs it and what they’ll do with it”. Alice reviewed our book on Goodreads, June 2009. “This book is staying on my “consult” shelf next to my desk. I expect to look at it often”. “The authors follow their own advice to demolish the walls of words. Don’t let the simplicity of the format delude you into thinking there isn’t any content. It is packed with great illustrations to explain point by point yet it isn’t overly burdened with heavy text. The book goes step by step on how to define requirements, write questions and instructions, select the proper web tools and test”. “I found Forms that Work fun and easy to read. It’s filled with illustrations and real-life examples, which makes it easy to understand how to put the concepts into practice. What I love about this book is that it’s compact and succinct. The authors deliberately decided to keep the book under 200 pages which I think was a very wise decision. The nitpicks I have is that I found quite a few typos. I also sometimes felt that the illustrations didn’t quite had the quality that I’d expect from a book like this. That said, these are only minor complaints and ones that shouldn’t prevent you from reading this otherwise excellent book”. “Forms That Work is filled to the brim with everything you need to know to make a form that will produce results. It is a definite addition to any web worker’s reference shelf”. James wrote a review on his blog, qwertyphilia, February 2009. Overall, it’s a nicely designed book which also includes cartoons, case studies and a useful list of further reading with helpful comments”.